, which combines the functionality of the Keyword Tool and Traffic Estimator into a smooth, integrated workflow. You can use Keyword Planner to find new keyword and ad group ideas, get performance estimates for them to find the bid and budget that are right for you, and then add them to your campaigns. You’ll also see some new features in the tool - some of which we’ll highlight below. To find new keyword and ad group ideas, use Keyword Planner just like you would the Keyword Tool. You can search for ideas related to a keyword, your website, or a category. A new feature in Keyword Planner also allows you to ‘multiply’ keywords, or combine two or more keyword lists to generate new keywords. Unlike Keyword Tool, where you were only able to target countries, you'll now be able to target individual cities and regions within a country. Also, for each keyword idea you'll only get statistics that are specific to that exact term. To decide what keyword match type to use, you'll have to add the keyword to your plan and look at performance estimates for each match type. 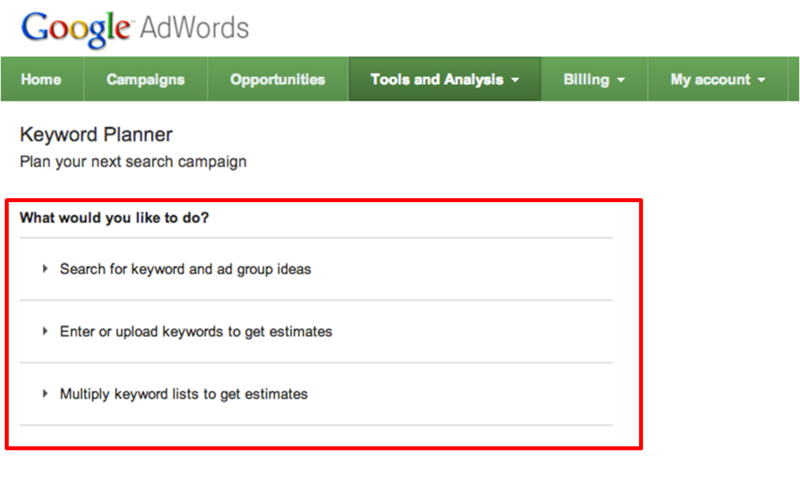 Next, you can review your keyword and ad group ideas and add them to a plan. Think of a plan as a shopping cart of ideas that you can add to a current or new campaign. While you build your plan, you can add ideas, delete ideas, and change your bid range to see total estimated clicks and cost. When you’re done building your plan, you can click “Get estimates and review plan” to pick a specific bid and get more detailed estimates. When you review your plan, you’ll see a graph with a range of max CPC bids and daily performance estimates for your keywords and ad groups. To see more detailed estimates, you can select a bid (and optionally, a budget as well). 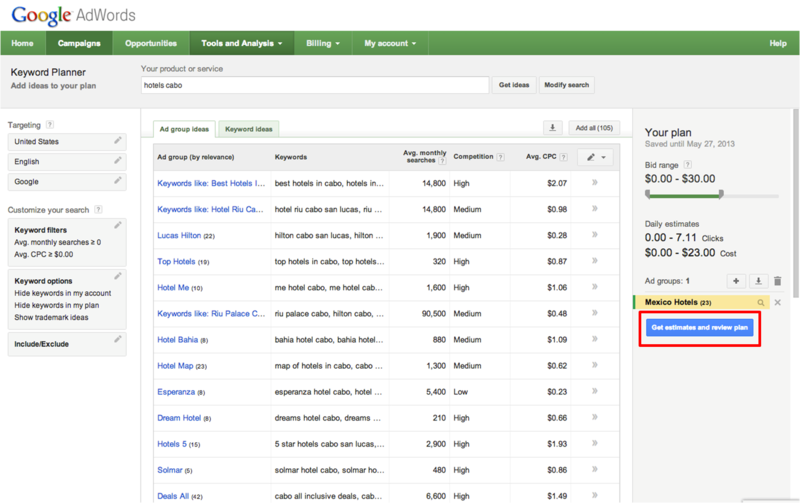 You can also update your targeting settings, keywords, and ad groups to further refine your estimates. For example, you can change all your keywords in an ad group to phrase or exact match to see how this could affect performance. When you’re satisfied with your plan, you can apply it to a new or existing campaign or download it to implement later. With the launch of this new, combined tool, we will be sunsetting the Keyword Tool and Traffic Estimator in about 60 days. Please view this article for an in-depth look at the differences between using Keyword Tool and Keyword Planner. Going forward, you'll have to log in to AdWords to use Keyword Planner, which will enable you to get customized results and estimates. We hope that this integrated workflow will help you build and grow your campaigns even more efficiently. To learn more about Keyword Planner, you can also visit the AdWords Help Center. 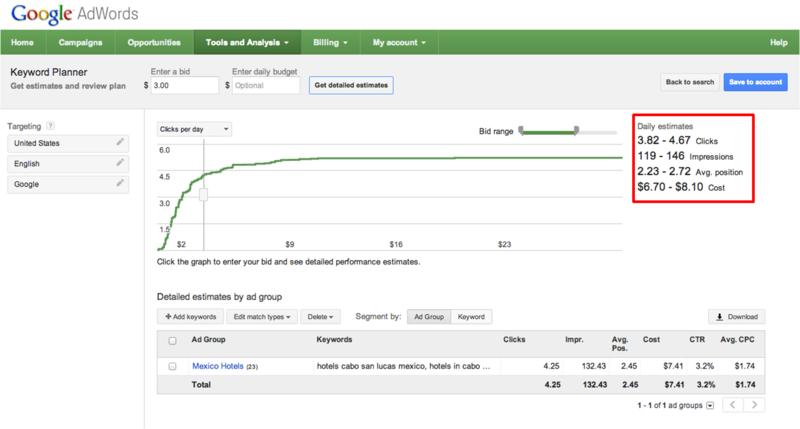 Behind every successful AdWords campaign are well planned out keywords and ad groups. In the past, you may have relied on tools like the Keyword Tool and Traffic Estimator to identify new keywords and ad groups, get traffic estimates, and choose competitive bids and budgets. Over time however, we’ve heard from you that having two tools for search campaign building was cumbersome. We’re constantly working to simplify the process of building campaigns, and today we’re happy to announce the launch of a new tool, Keyword Planner, which combines the functionality of the Keyword Tool and Traffic Estimator into a smooth, integrated workflow. You can use Keyword Planner to find new keyword and ad group ideas, get performance estimates for them to find the bid and budget that are right for you, and then add them to your campaigns. You’ll also see some new features in the tool - some of which we’ll highlight below.